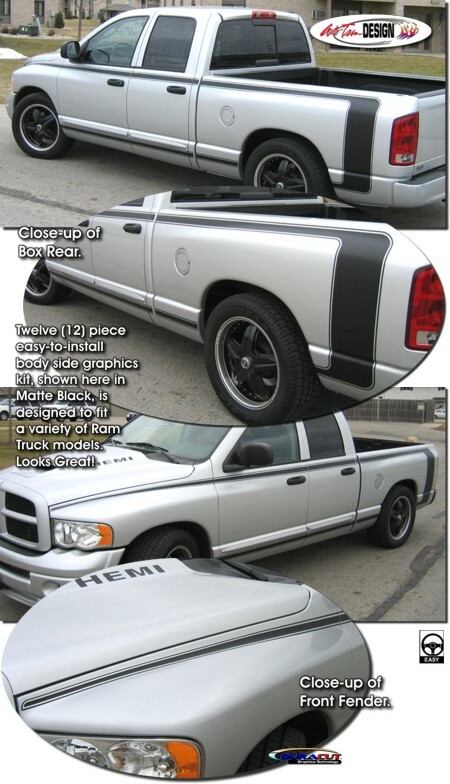 Set your '02-'08 Dodge Ram Truck apart from the rest with this classic looking body side graphic set. Available in a variety of colors, twelve (12) piece easy-to-install graphic kit is packaged with one (1) left and one (1) right side graphic. Looks Terrific! This kit is very versatile. It has been designed to fit a wide variety of Dodge Ram models such as Regular, Quad and Mega Cab trucks with Short 6.25’ and 8’ Long boxes. With a little creativity, this graphic may also work with trucks that have rear Dually Fenders. Due to the wide variety of vehicle platforms this kit fits, you may find extra pieces that are not required for your application. It would be good however to keep these pieces for future use in the event replacement is necessary. Graphic is designed to simply install approximately 1" (25.40mm) below the top of the Box Rear as shown and requires slight trimming at each door jamb and Cab/Bed connection once installed.